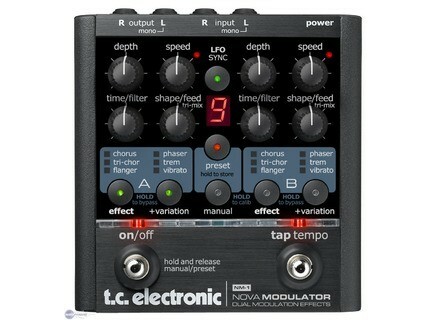 NM-1 Nova Modulator, Multi-Effects for Electric Guitar from TC Electronic in the Nova series. TC Electronic announces the shipping of Nova Modulator and Nova Dynamics, two brand-new guitar pedals in the Nova Series. The Nova Modulator houses two brand new effects plus all of TC’s most renowned modulation effects, and its dual engine design allows for endless combinations. 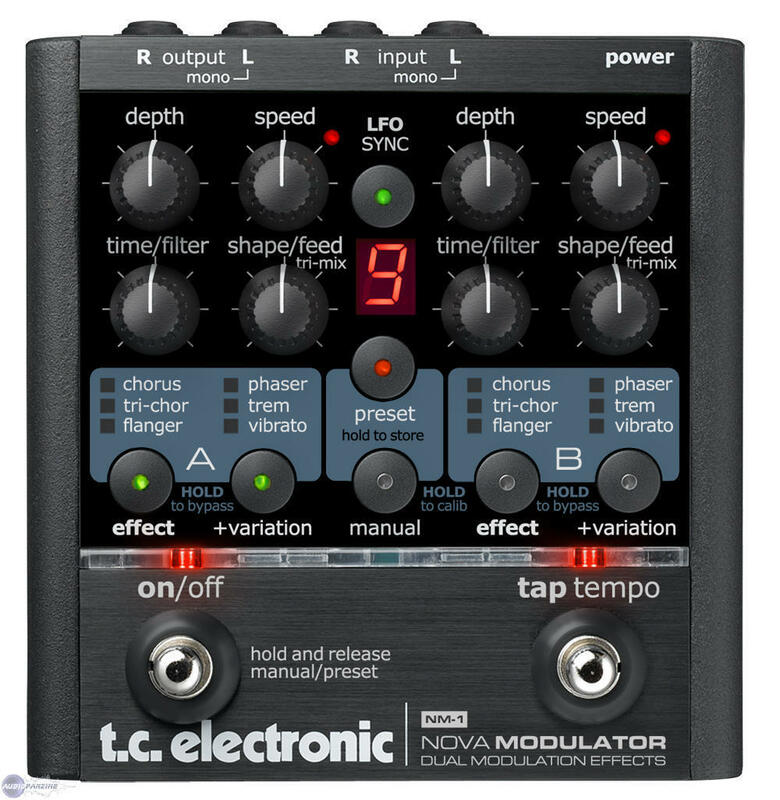 It offers seven modulation effects: chorus, the new tri-chorus, flanger, the new through-zero-flanger, phaser, tremolo, and an upgraded vibrato. The chorus, flanger, phaser, and tremolo effects are taken straight from TC’s G-System. The new tri-chorus effect uses three stereo choruses with various offsets for depth, speed, phaser and chorus delay time to produce a unique, broad and lush chorus sound. The new through-zero-flanger reproduces the classic tape flanging sounds of the 60s and 70s, and the upgraded vibrato features a new ramp that allows the user to fade in the effect. The two identical effect engines allow the user to combine two different modulation effects or to combine two identical algorithms for a more extreme and pronounced effect. The LFO synchronization ensures that the two engines are synchronized in time, and the new LFO trigger makes the effect start right on the beat when activating the pedal. For preset control there is one manual setting that always outputs the current position of the knobs and buttons, as well as nine storable presets. Other features include tap tempo, auto input gain adjustment and stereo in/out. Dean USA announces Dime Razorback 10K Dean Guitars introduces the USA Dime Razorback 10K, a diamond plate top version of this very successful model. Dean USA Announces The MHG Soltero Model The new MHG Soltero is a deep carved mahogany body with a natural "open grain" finish. Gibson Launches New LE Robot Models Gibson Guitar announced a limited edition offering of the new Gibson Robot Les Paul Studio and Robot SG Special.